Posted on March 30th, 2017. Filed under: General News, Room One News. Music is a big part of our days in Room One. We sing karakias before all of our meals, sing and dance during the day (especially during our mat times), have music playing during our sleep times, and often have music playing in the background of our day. Recently, we have been experimenting with sounds through a collection of instruments. 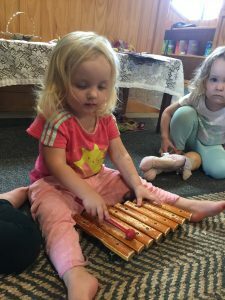 Nicole likes to sit in a small group, and talk about each instrument and how it makes its noises, and then pass the instrument around the circle so that each child can try it out. Once the children experience each instrument, they get to choose the one they want to play, and Nicole will play a melody on the xylophone, while the children sing along and play their instrument. We have discussed that sound makes vibrations, and that the vibrations come into our ears. 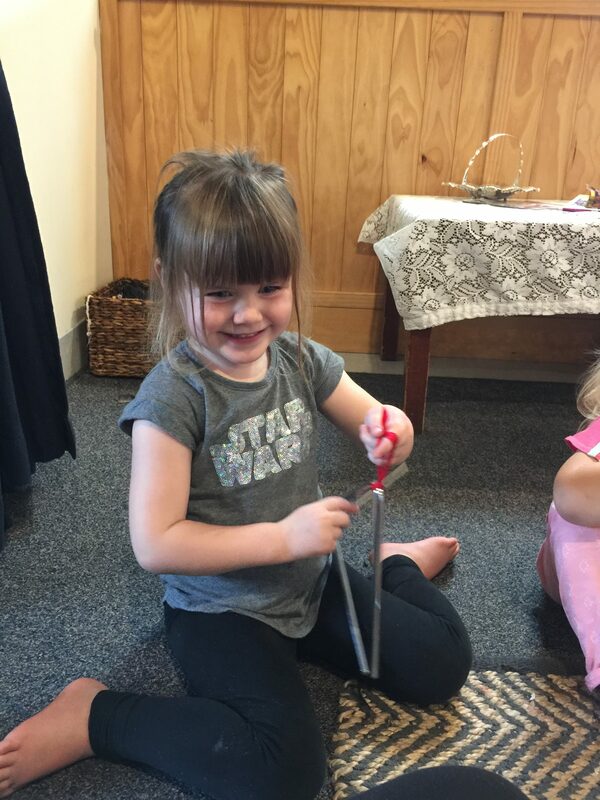 Especially when using the triangle, the children can experience the vibrations by closing their eyes and Nicole will strike it with its beater, and the children can feel the sound waves near their face. 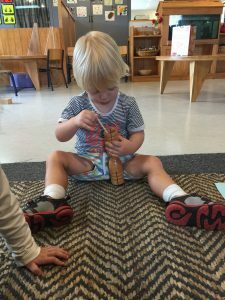 They also learn about the vibrations when they hold the triangle on the floor, or in their hand, rather than the ribbon, as it makes a different noise because the vibrations go into the floor or their hand. familiarity with a variety of types of music, art, dance, and drama as expressions of feeling, mood, situation, occasion, and culture. Music also provides melodic and rhythmic patterns, which help the brain to develop its pattern deciphering skills as well as memory. Children tend to be able to learn and memorize words and ideas when put to a melody. Music is also a creative experience, and we want to allow our children to express themselves in whichever means speak to their inner self – so providing these opportunities throughout the day help the children to become comfortable and confident in expressing who they are. 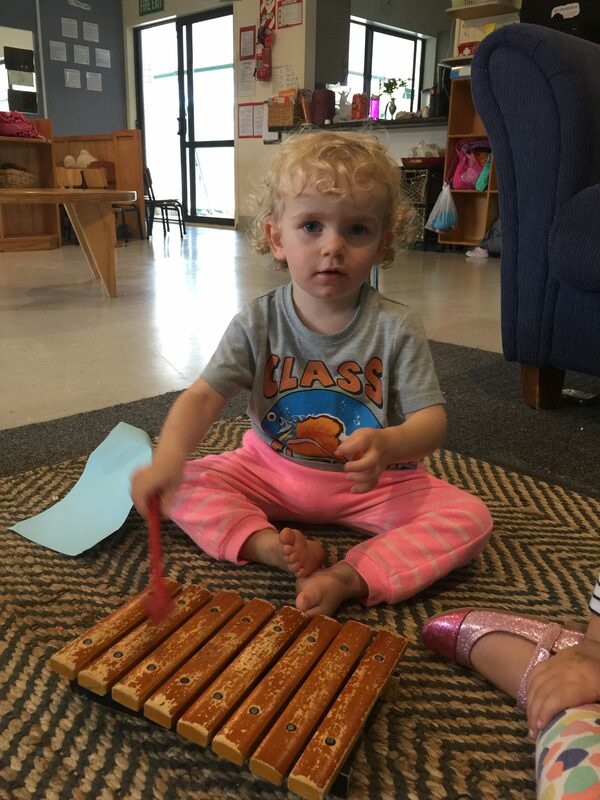 The past few weeks of musical instrument activities have shown the teachers that the Room One children are highly interested in musical experiences. The Room One teachers will be creating more opportunities for the children to create music alongside more singing and dancing! If you come into the room and hear music playing, songs being sung, or see children dancing, we hope that you join in!